When looking at the 2018 calendar, there were a few events that stood out to me. A couple races were included due to their prestige, some for their timing, others because they would be something new for me. 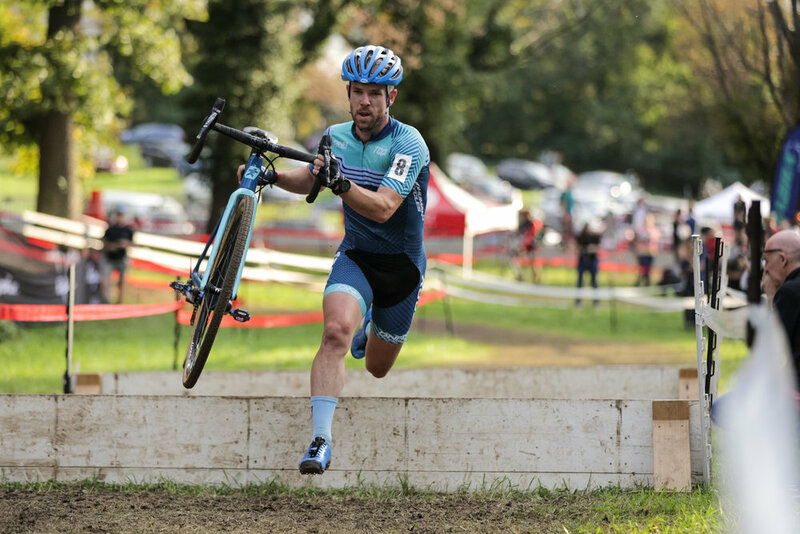 But one event that stood out the most was the DCCX race in Washington D.C. 2017 was the first year that I headed back East to partake in the fun. Everything from the course, to the organization, to the people made this event special for me and as I planned out my season, DCCX had a big ole star next to it. So, after the first block of racing was done and dusted (literally – West Sacramento GP of CX), I cleaned myself up and got ready to head to the Nation’s Capital for another year of cyclocross fun. Back home from California, I was able to unpack my suitcase for a few days and settle back into life at home. Let me tell you, that is such a nice feeling! As the season goes on, I find that I get into a rhythm – Monday is laundry & cleaning, Tuesday is repacking & bike shipping with BikeFlights.com, Wednesday is the final day of packing, Thursday is travel day, Friday is openers, Saturday & Sunday race. Then the cycle repeats until we leave for Europe. Relaxed and happy, I was able to get some good miles in, enjoy some good company and face time with friends I don’t see often during the season, and, most importantly, get some sleep! But while the week after West Sacramento was great, Mother Nature had other plans. Rain drifted into Dallas on Friday evening and carried on through the weekend and the week after. I’m usually not too worried about riding in the rain or in sloppy conditions, but with temps in the 40’s and flood warnings all over town, I was less inclined to venture outdoors… Well, it’s better to say the thought of cleaning post-ride was enough for me to ride inside. By Thursday, I was done with gray skies and wet weather. So as the aforementioned schedule dictated, I gathered my cyclocross gear and hopped on a flight up to D.C. Friday was a casual day, spending some time with my hosts Erika and Stephen before running some errands and heading to the course. Scott Dedenbach of Bike Shop CX fame had already set up camp by the time I had arrived and was nice enough to let me crash the party. With him was Chris Aitken (Focus Attaquer CX Team) and his girlfriend Tia. We had a great afternoon just joking around and Scott was kind enough to help me set up my bikes. Torqued down and ready to go, I was feeling good about the weekend ahead! I woke up on Saturday to see wet pavement and cloudy skies. While there was no rain in the forecast, a few passing showers overnight had left enough moisture to soften the ground. In 2017, the race had been a hot, dusty affair. This year it seemed like it would be a slightly different experience. The course was somewhat unchanged from the year before, traversing the grounds of the Armed Forces Retirement Home in D.C. After pre-riding, I was feeling good about the track and my chances on the day. Moreover, I had the chance to catch up with friends which had me buzzing as I awaited our afternoon start time. I rolled into the last spot on the front row of the grid. With the likes of Kerry Werner (Kona-Maxxis-Shimano), Eric Thompson (MSPEEDWAX), Travis Livermon (The Endurance Collective), Dan Chabanov (Richard Sachs), Merv Davis (Cycle-Smart), Chris and a host of others, it was sure to be a competitive race. The whistle blew, and I was quick into the pedals. Kerry took the lead through the start/finish and I remained right on his wheel as we entered the course. Not wanting to go too hard, too early, I slowed my tempo to settle into the group and allow others to chase Kerry as he laid down a fast pace. I assumed my spot about fifth wheel and held on for the ride. By the end of the first lap, Kerry was already off the front and Eric, Chris, Merv, and I chasing. Travis had a bit of a slower start but made his way up to our chasing group and went directly to the front, and the rest of us were content to let him do so. Two more laps down and the only jockeying for position was at the back of the chase between Chris, Merv, and I. With five laps to go, the group spread across the road as we turned onto the pavement. Chris and Merv looked like they were both having troubles in some of the power sections (to me) and with no one assuming control, I decided to send it and hit the front setting a hard tempo. Bad choice. As we exited the first technical section of the track, Travis came around through an uphill power section and hit the gas. There was nothing I could do to respond, and I watched as Eric and Merv went up the road. In the moment, I was content and let them attack, betting that I could recover a bit and catch back on. How naïve I was in my tactical calculations, as Travis drove the pace and the group accelerated away. I pedaled hard to keep them close and took advantage of the recovery sections to grab my breath. Still riding in fifth, I wasn’t making much headway, but I wasn’t losing much time either. Moreover, I noticed Merv was now chasing by himself as Eric and Travis rode in pursuit of Kerry. Chris came around me just before passing pit two as we went into three laps to go. Chris had given me a heads up, but his acceleration over the top was fast and my time to respond was slow. I kept him somewhat close, but my technique in some of the corners was starting to deteriorate and the gap began to open up. I redoubled my efforts on the gas, pushing especially hard on the sections of soft ground. But it was to no avail and I carried on in no man’s land, eventually crossing the line in sixth place. While a bit disappointed to squander good opportunity at a top five finish, I was happy that I could still pull out a top ten result. After a lovely dinner with my cyclocross family on Saturday night and some time at the Whole Foods cookie bar (#cookiewatts ARE a thing, I promise! ), I was ready for a bit of redemption on Sunday. The course was reversed, with a few minor changes from Saturday and the track provided a whole new set of challenges. With strong winds, the conditions were much drier than the day before and seemed to be much faster with the way that the course flowed. I was again feeling confident as the course suited me well and took the time to get mentally prepared for the battle ahead. We assumed our spots on the grid, but today I was not as quick off the line today and by the time I got into my pedals, I was shuffled back to about tenth wheel. There was a time when I would have panicked and wasted a ton of energy in an attempt to regain the spots I had lost. But a cooler head prevailed, and I was patient and picked my spots to move up. By the end of the first lap, I was back in a good spot in the second chase group battling for fourth through eighth. On course, Kerry was off the front of the race again, this time joined by Travis and Eric, while Dan Chabanov, Michael Owens (Richard Sachs), Merv Davis, Chris Aitken, and I a few more seconds back from them. With the front group sorted out, the battle began for who would finish out the wide-angle podium (WAP). The gap was still relatively small to the leaders and after another lap, Michael Owens set off to bridge the gap. He absolutely ripped the back section of the track, deftly flicking his bike left and right, as he chased down the leading trio. It looked for a moment that he would make the juncture. But just as he was closing the final few meters, Michael rolled a tubular dropping into the downhill u-turn around a tree. Our chasing group was now four. Four left with four laps to go and the group’s collective speed was starting to wane. Merv appeared to be struggling a bit and was put into more trouble when Chris went to the front to set the tempo. I was attentive at the back of the bunch and jumped around Merv to make sure that I didn’t miss the move. As we came onto the start/finish pavement, Chris was on the pedals again, and I moved over top of Dan to chase Chris down yet again. The cookie watts were being used in full effect today! I joined Chris, or was at least chasing a bike length behind, as we carried on past pit one. The legs were still turning over easy, effortlessly putting power down in my pursuit, but I was still having trouble in some of the corners. Each time I missed my line, Chris would pull out a few more seconds with smooth, effortless handling. First it was five seconds. The next time across the line, the gap was ten. With one final lap, I pushed as hard as I could in all of the power sections to chase Chris down, but it was not to be, and I crossed the line in fifth place. Little victories. To say I was happy with my results at DCCX would be an understatement. I was ecstatic! But what is more important to me is the consistency that I showed and the attitude to bounce back on day two. ‘Grit’ is a word that I hope to be synonymous with my racing style. It’s not always smooth. It’s not flashy. But dammit if it isn’t a demonstration of determination. While there is still much that I can improve upon, I boarded the plane on Monday morning satisfied with my return to DC and looking forward to the block of racing ahead. Thank you to everyone that made this trip such an amazing weekend! Most especially Taylor Jones (and Julie and co.) for organizing the race and receiving my Bike Flights shipment; Scott Dedenbach for being so kind and welcoming, and for fixing up my KindHuman Küdüs to be in top shape; Erika and Steve for being such gracious hosts; Bruce Buckley for the cheers and some amazing photography work; and to Brent, Korin, Declan, Ian, Jeff, and the rest of my cyclocross family for encouraging me and for always being there to lend a helping hand! Next up, it’s back to Cincinnati for the return of the Kings!